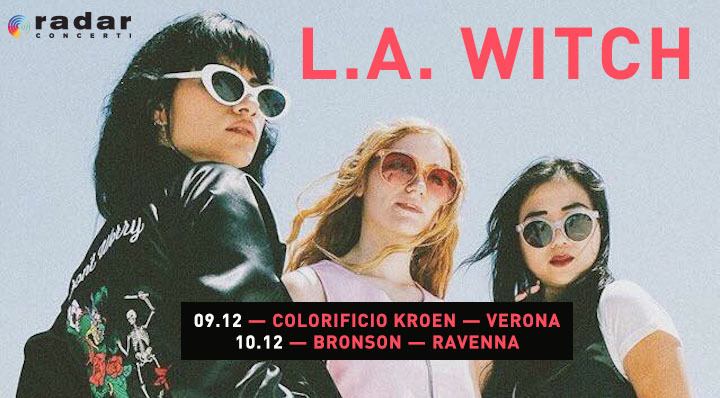 Il trio losangelino L.A. WITCH sarà per la prima volta in Italia per due date esclusive: il 9 dicembre al Colorificio Kroen di Verona e il 10 dicembre al Bronson di Ravenna. Ne abbiamo approfittato per conoscerle meglio. Irita, Ellie e Sade ci hanno raccontato delle loro influenze, da Ginger Baker a Antuan Newcombe, da Kurt Cobain agli Sonic Youth, dei loro concerti del cuore come quello di King Gizzard & The Lizard Wizard o di The 13th Floor Elevators. Abbiamo parlato anche dei loro negozi preferiti (vintage e di seconda mano) e ovviamente di Trump che non considerano il loro Presidente. Anzi, alla fine dell’intervista troverete un appello: qualcuno vuole sposarle così che possano rimanere per sempre qui? 1-You have released your record titled “Drive Your Car”. Anything in particular you were striving for when you recorded it? SADE: not necessarily. We are still very new to recording and it’s a learning process. It’s a whole different art that I could love once I understand it more. Right now, it’s more of a tedious and emotionally draining thing. We were just excited to finally have a physical release and we’re quite happy with the result. 2-How deliberately or consciously ‘punk’ are you? ELLIE: I don’t really feel like I consciously try to be any type of way when playing the songs..I just play what feels right. SADE: it’s a more subconscious thing. 3-Which famous musicians do you admire? Why? ELLIE: I love Ginger Baker because he is so diverse. I also really love Bill Ward and John Bonham because they play so heavy and have great feel. SADE: Antuan Newcombe for his songwriting ability. The Cramps for their style and attitude. Kurt Cobains soul. Hope Sandovals voice. Sonic Youths gear. The Jesus and Mary Chain for their Fuzz. 4-Which famous musicians have you learned from? SADE: I guess you can say I’ve learned a little something from all of my influences. I love knowing everything about them from their background story to their gear. 5-When L.A. Witch were born? IRITA: Sade and I were jamming with two other girlfriends at the time. When we lost our drummer to NYC, Ellie became part of the band. 6-What are your fondest musical memories? ELLIE: I loved watching King Gizzard and the lizard wizard at Desert Daze this year. They have two drummers and they are so in sink, even their dynamics were perfect together. SADE: is have to agree with watching the 13th floor elevators along with APTBS. Also, watching Fred and Toody from Dead Moon watch Black Mountain from side stage. There was something so surreal about it. 7-What about Los Angeles music scene in this time? IRITA: There’s a lot of great bands coming It of LA right now. A lot of them have been touring, so it’s fun to run into them out in Europe. IRITA: We heard the news on the plane just as we were landing in London. He’s not our president. Bernie for life. SADE: don’t even get me started. I might have to find myself a European husband or wife. 9-Do you get nervous before a performance? ELLIE: Almost always. No matter how big or small the show is. 10- Have you ever played in Italy before? And in Europe? IRITA: it’s our first time playing in Europe. We couldn’t ask for better people to play to. 11- We like your style, do you buy dresses online? IRITA: I buy a lot of vintage, mostly thrift stores or vintage shops. ELLIE: Same, I mostly shop at Thrift stores. Most of my clothes I’ve had for years. SADE: there’s a lot of cool thrift and vintage stores when we are on tour and more affordable then it is in l.a.
12- How many days you will stay here? 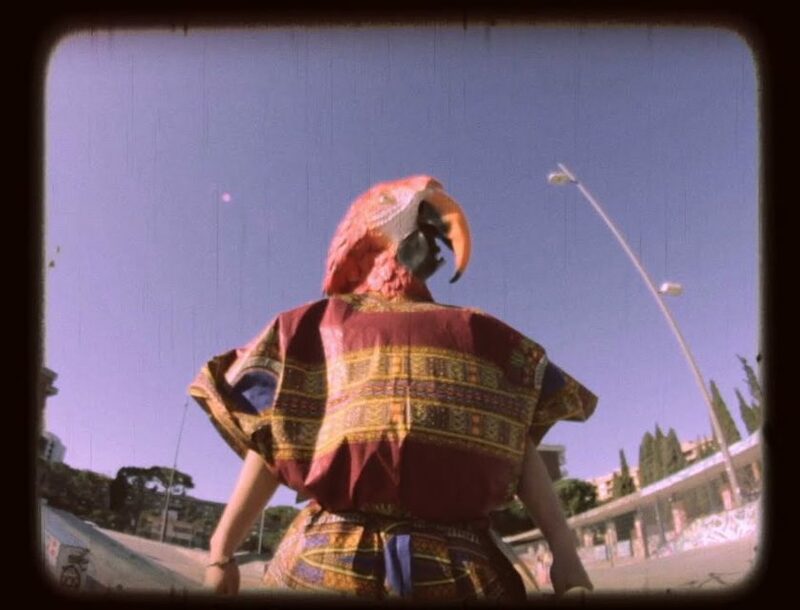 IRITA: We’re in Italy for 2 nights. But maybe we want to stay forever because of Trump. If anyone wants to get married for citizenship, let us know!